Sleep disturbances are symptoms of psychiatric conditions that can worsen prognosis; however, nonpharmacologic treatments are available and effective. Sleep disturbance is so common in neuropsychiatric conditions, it is considered a cross-cutting symptom.1 It often manifests as insomnia, hypersomnia, nightmares, or circadian dysregulation. Sleep disturbance can be a precipitant or a prodrome, likely through multiple interconnected pathways, and it can also exacerbate symptoms and increase the risk of relapse. Brief screening instruments help assess for the various types of sleep disturbance common in neuropsychiatric conditions. Although appropriate medications are essential for effective management of the neuropsychiatric condition, nonpharmacologic approaches such as cognitive-behavioral therapy (CBT) offer highly effective evidence-based treatments for insomnia and adjunctive treatments for hypersomnia, nightmares, and circadian dysregulation. In neuropsychiatric conditions, sleep disturbance most commonly manifests as insomnia, hypersomnia, nightmares, or circadian dysregulation, although some conditions are associated with increased risk for other sleep disorders (eg, sleep apnea in PTSD, restless legs in ADHD). Mechanisms of action for sleep disturbance in neuropsychiatric disorders are multifactorial and poorly understood. The causal relationship is almost certainly bidirectional and complex, as neuropsychiatric disorders can cause or contribute to disturbed sleep, while disrupted sleep exacerbates symptoms, worsens coping skills, impairs daily functioning, and increases risk for onset of, and relapse to, neuropsychiatric problems. Factors influencing sleep disruption can be direct or indirect. Direct factors are intrinsic to the overlapping pathobiology of sleep disorders and psychiatric conditions. In sleep loss, emotion dysregulation and attention dyscontrol may exacerbate MDD or BPD. Neurohormonal dysregulation has been implicated in a variety of neuropsychiatric conditions, most notably serotonergic and dopaminergic dysfunction and is involved, at least partially, in the pathogenesis of most psychiatric disorders (MDD, GAD, SSD, SUD). Given the critical role of monoamines in wakefulness, sleep dysfunction in these disorders is not surprising. The imbalance between monoaminergic and cholinergic tone may lie at the core of the characteristically reduced REM-sleep latency and increased REM sleep and density in patients with MDD.3,7,8 Similar REM-sleep abnormalities have been noted in other conditions (SSD, SUD) but are somewhat inconsistent between individuals, disorders, and studies. However, clinicians seeing individuals with any variety of primary medical, neurologic, or psychiatric conditions will likely not have the time or resources to screen broadly for sleep disorders in most patients. Tiered approaches, such as an electronic health record (EHR) sleep-screening questionnaire20 or starting conversations by asking patients if they are satisfied with their sleep can often point the clinician in the right direction. As mentioned above, certain sleep disorders tend to associate more commonly with some conditions than others. As such, targeted questionnaires may be appropriately applied in certain contexts: sleep diaries and the morningness-eveningness questionnaire (MEQ) might reveal circadian dysfunction in neurodegenerative and neurodevelopmental disorders; whereas, sleepiness scales and fatigue measures (like the fatigue severity scale) may be more appropriate in assessing individuals with neurologic injury (eg, traumatic brain injury, stroke, multiple sclerosis) and/or depression. 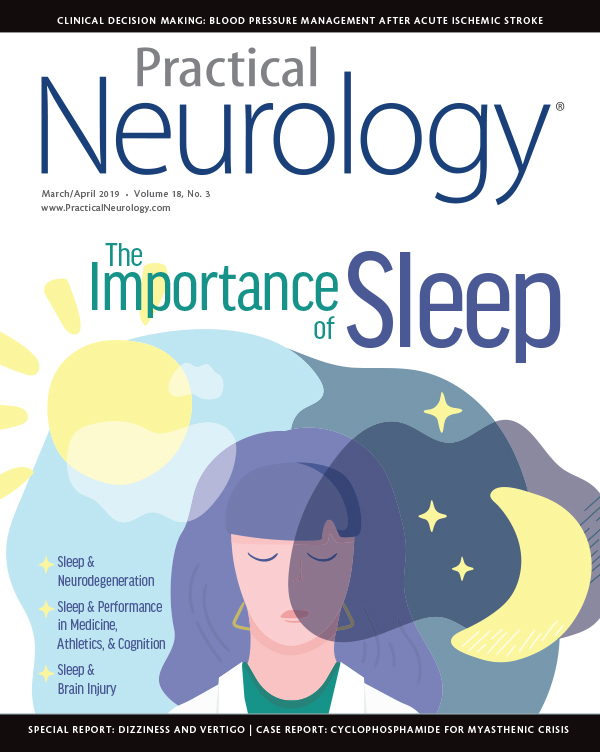 Appropriate medications, including proper timing to minimize impact on healthy sleep-wake patterns, are critical for effective management of neuropsychiatric conditions. However, cognitive-behavioral therapy (CBT) is the recommended, evidence-based treatment for insomnia and can be an important adjunctive treatment for hypersomnia, nightmares, and circadian dysregulation.21-23 Techniques of CBT are based on the demonstrated interconnection between thoughts, feelings, behaviors, and physiology, so that effecting change in any one of these domains can catalyze change in one or more of the other domains. Figure. Three Factors Contributing to the Development of Chronic Insomnia. 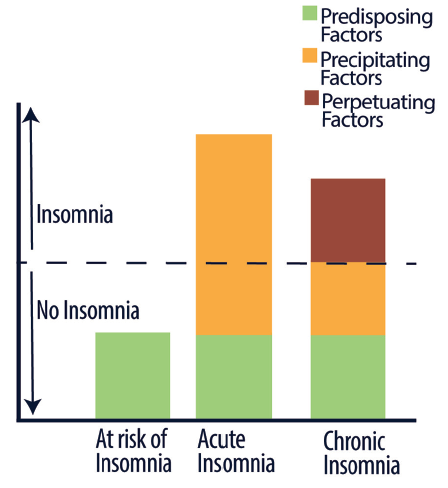 Factors that contribute to insomnia may be predisposing (green), precipitating (gold), or perpetuating (red). Insomnia occurs only when the sum of these factors goes above a certain threshold (dashed line). Given the ubiquity of sleep disturbance in neuropsychiatric conditions and the sleep-disruptive effects of psychiatric medications, it is fortunate that nonpharmacological approaches employing CBT can treat insomnia successfully and provide helpful adjunctive treatments for hypersomnia, nightmares, and circadian dysregulation. These techniques, which often overlap with CBT techniques used to treat neuropsychiatric conditions, target cognitive, emotional, behavioral, and physiologic factors that perpetuate insomnia and other sleep disturbances. They can be delivered in a flexible format—online, by phone, or in individual or group settings—and modified to fit the preferences and needs of specific patients and populations. While treatment guidelines for hypersomnia, nightmares, and circadian rhythm disorders are currently limited by insufficient research, guidelines for multicomponent CBT for insomnia are well validated and highly effective. 1. American Psychiatric Association, Diagnostic and Statistical Manual of Mental Disorders (DSM), 5th Ed. Washington, DC: American Psychiatric Association Publishing; 2013. 2. Roth T, Jaeger S, Jin R, et al. Sleep problems, comorbid mental disorders, and role functioning in the national comorbidity survey replication. Biol Psychiatry. 2006;60(12):1364-1371. 3. Benca RM, Obermeyer WH, Thisted RA, Gillin JC. Sleep and psychiatric disorders. A meta-analysis. Arch Gen Psychiatry. 1992;49(8):651-670. 4. Cortese S, LecendreuxM. Sleep disturbances in attention-deficit/hyperactivity disorder. In Kryger M, Roth T, Dement WC. Principles and Practice of Sleep Medicine. 3rd ed. Philadelphia, PA: Elsevier; 2017:1390-1397.e4. 5. Harvey AG, Murray G, Chandler RA, Soehner A. Sleep disturbance as transdiagnostic: consideration of neurobiological mechanisms. Clin Psychol Rev. 2011;31(2):225-235. 6. Roehrs T, Roth T. Medication and substance abuse. In Kryger M, Roth T, and Dement WC. Principles and Practice of Sleep Medicine. Philadelphia, PA: Elsevier; 1380-1389.e4. 7. Minkel JD, Krystal AD, Benca RM. Unipolar major depression. In Kryger M, Roth T, Dement WC. Principles and Practice of Sleep Medicine. 3rd ed. Philadelphia, PA: Elsevier; 2017:1352-1362. 8. Lauer CJ, Riemann D, Wiegand M, Berger M. From early to late adulthood. Changes in EEG sleep of depressed patients and healthy volunteers. Biol Psychiatry. 1991;29(10):979-993. 9. Nestler EJ, Barrot M, DiLeone RJ, Eisch AJ, Gold SJ, Monteggia LM. Neurobiology of depression. Neuron. 2002;34(1):13-25. 10. Veatch OJ, Maxwell-Horn AC, Malow BC. Sleep in autism spectrum Disorders. Curr Sleep Med Rep. 2015;1(2):131-140. 11. DeMartinis NA, Winokur A. Effects of psychiatric medications on sleep and sleep disorders. CNS Neurol Disord Drug Targets. 2007;6(1):17-29. 12. Carney CE, Buysse DJ, Ancoli-Israel S,The Consensus Sleep Diary: Standardizing prospective sleep self-monitoring. Sleep. 2012. 35(2):287-302. 13. Bastien CH, Vallières A, Morin CM. Validation of the Insomnia Severity Index as an outcome measure for insomnia research. Sleep Med. 2001;2(4): 297-307. 14. Buysse DJ, Reynolds CF 3rd, Monk TH, Berman SR, Kupfer DJ. The Pittsburgh Sleep Quality Index: a new instrument for psychiatric practice and research. Psychiatry Res. 1989;28(2):193-213. 15. Johns, M.W., A new method for measuring daytime sleepiness: the Epworth Sleepiness Scale. Sleep. 1991;14(6):540-545. 16. Hoddes E, Dement W, Zarcone V. The development and use of the Stanford Sleepiness Scale (SSS). Psychophysiology. 1972;9(150):431-436. 17. Adan A, Almirall H. Horne & Östberg Morningness-Eveningness Questionnaire: a reduced scale. Pers Individ Dif. 1991;12(3):241-253. 18. Roenneberg TA, Wirz-Justice A, Merrow M. Life between clocks: daily temporal patterns of human chronotypes. J Biol Rhythms. 2003;18(1):80-90. 19. Mastin DF, Bryson J, Corwyn R. Assessment of sleep hygiene using the Sleep Hygiene Index. J Behav Med. 2006;29(3):223-227. 21. National Institutes of Health State of the Science Conference Statement: Manifestations and management of chronic insomnia in adults: summary. Sleep. 2005;28(9):1049-1057. 22. Wilson SJ, Nutt DJ, Alford C, et al., British Association for Psychopharmacology consensus statement on evidence-based treatment of insomnia, parasomnias and circadian rhythm disorders. J Psychopharmacol. 2010;24(11):1577-1601. 23. Qaseem A, Kansagara D, Forciea MA, et al., Management of chronic insomnia disorder in adults: A clinical practice guideline from the American College of Physicians. Ann Int Med. 2016;165(2):125-133. 24. Spielman AJ, Caruso LS, Glovinsky PB. A behavioral perspective on insomnia treatment. Psychiatr Clin North Am. 1987;10(4):541-553. 25. Blom K, Jernelöv S, Rück C, Lindefors N, Kaldo V. Three-year follow-up comparing cognitive behavioral therapy for depression to cognitive behavioral therapy for insomnia, for patients with both diagnoses. Sleep. 2017;40(8):zsx108-zsx108. 26. Edinger JD, Olsen MK, Stechuchak KM, et al. Cognitive behavioral therapy for patients with primary insomnia or insomnia associated predominantly with mixed psychiatric disorders: a randomized clinical trial. Sleep. 2009;32(4):499-510. 27. Morgenthaler T, Kramer M, Alessi C, et al. 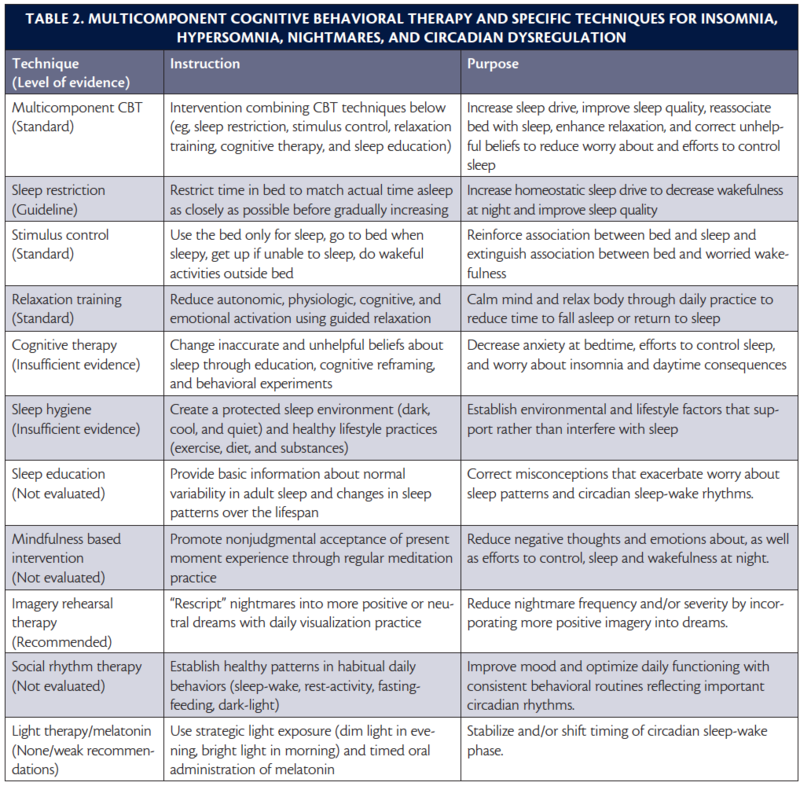 Practice parameters for the psychological and behavioral treatment of insomnia: an update. An American Academy of Sleep Medicine Report. Sleep. 2006;29(11):1415-1419. 28. Spielman AJ, Saskin P, Thorpy MJ. Treatment of chronic insomnia by restriction of time in bed. Sleep. 1987;10(1):45-56. 29. Bootzin RR, Epstein DR, Wood JM. Stimulus control instructions. In: Hauri PJ (ed). Case Studies in Insomnia. New York, NY: Springer; 1991:19-28. 30. Harvey AG. A cognitive model of insomnia. Behav Res Ther. 2002;40(8):869-893. 31. Hauri PJ. Sleep hygiene, relaxation therapy, and cognitive interventions. In: Hauri PJ (ed). Case Studies in Insomnia. New York, NY: Springer; 1991:65-84. 32. Ong JC, Smith CE. Using mindfulness for the treatment of insomnia. Curr Sleep Med Rep. 2017;3(2):57-65. 33. Krakow B, Zadra A. Clinical management of chronic nightmares: imagery rehearsal therapy. Behav Sleep Med. 2006;4(1):45-70. 34. Morgenthaler TI, Auerbach S, Casey KR, et al. Position paper for the treatment of nightmare disorder in adults: An American Academy of Sleep Medicine Position Paper. J Clin Sleep Med. 2018;14(06):1041-1055. 35. Haynes PL, Gengler D, Kelly M. Social rhythm therapies for mood disorders: an update. Curr Psychiatry Rep. 2016;18(8):75. 36. Auger RR, Burgess HJ, Emens JS,et al. Clinical practice guideline for the treatment of intrinsic circadian rhythm sleep-wake disorders: advanced sleep-wake phase disorder (ASWPD), delayed sleep-wake phase disorder (DSWPD), non-24-hour sleep-wake rhythm disorder (N24SWD), and irregular sleep-wake rhythm disorder (ISWRD): an update for 2015. J Clin Sleep Med. 2015;11(10):1199-1236.